Shopping is a must in Dubai. When heading back to our hometowns; we all want to take along the best things for ourselves and the finest Dubai souvenirs and gifts for our loved ones. However, it is sometimes confusing to choose from the gargantuan shopping oodles of souvenirs and gifts that are offered by Dubai. Especially when you are new to the city and not familiar with its peculiarities and specialties. But there is nothing to worry about. The key for a hassle free souvenirs and gift shopping from Dubai is to be prepared and to recognize some of the most famous mementos that are highly preferred by the visitors. We all have some top picks whenever we go for shopping. And, some of these picks are inspired by the culture, society and places. You happenstance is expected to be the same when you visit Dubai. This is truly a shopper’s paradise; and you may find almost everything in this shopping nirvana. Although you may discover numerous gift items in Dubai, that you can purchase from the city; however, there are some amazing remembrances of the place that you must take along as keepsakes for yourself and for the people you cherished the most. We have already covered top 10 must-buys in Dubai and below mentioned are the most famous and highly appreciated Dubai souvenirs and gifts that visitors usually prefer to buy from Dubai. Dubai was formerly recognized by the city of the Burj-ul-Arab. And today, most of us recognize Dubai by Burj Khalifa. These cenotaphs have become the identity of the city; and what would be better than their small models that can be given as a souvenir to your loved ones. Paper weights with a complete light show of Burj-ul-Arab & Burj Khalifa is among the best Dubai souvenirs that you can buy on your trip. You may also find their small models in local shops and over the gift kiosks in the lavish shopping malls of Dubai. T-shirts beautifully imprinted with the ‘I love Dubai’ testimonial are also among the top choices of visitors. You may find a variety of these engraved T-shirts easily across Dubai malls and souks at very affordable price. This is the item that you can take along with numbers so that you can present at least one piece to your each friend. In actual the very best of the Dates in Dubai are the Dates from Saudi Arabia. However the Dates from Bateel are particularly very famous. Filled with almonds and coated with chocolate, these are the sweetest Dubai gift to be given to your nearest and dearest. Available in all the shopping centers, hypermarket and grocery shops. Oudh & Bakhoor are the Fragrances of Dubai and a perfect & unique gift that you can buy on your trip. Buying these mesmerizing Emirati scents to hand out your kinfolks as a souvenir is a perfect choice to nudge them with your recollections from Dubai. Oudh and Bakhoor can be easily purchased from Spice Souk of Dubai or from the kiosks in the malls. Persian rugs and carpets could be an epochal reserve, and it is one of the most expensive Dubai souvenir that you can bring back to your dearests from Dubai. Although you can find an affordable variety of them in Dubai Souks; however a sovereign display of craft can be found at National Iranian Carpet, Pride of Cashmere and Persian Carpet House and Antiques. Tip: While buying one for you, use the very best of your bargaining skills to bring the price at least to the half of the quoted one. Being a fan of the city, you can buy anything that your heart desires; but what can be better than a souvenir of camel-milk chocolates. These chocolates are specifically famous; as they are made up of camel-milk, which is widely known for its health benefits. Camel-milk chocolate bars are reasonably priced to minimum 40 AED and you may easily find them in supermarkets and kiosks in Dubai. Fully enriched with nutrition and taste, this is the yummiest souvenir to take away with you from Dubai. Arabic Attars and essences are idiosyncratic; as they are munificent to remind you of Dubai’s royal treat. 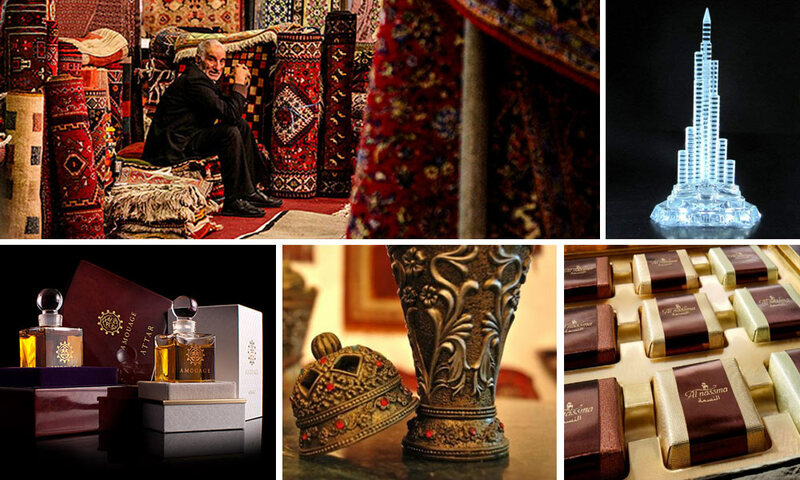 Arabic Attars, essences and perfumes are the best choice to share the grandiose delicacy of Dubai with your dear ones. You may easily find them in malls and shops at affordable prices. You may also find a large array of appealing fragrances and can choose the one that suits your taste and personality. Traditional curved Arabic daggers have been a rare sight now; however you may still sometimes find Emiratis wearing them on their customary national dresses. Traditional curved Arabic dagger decorative is very famous these days; and it is one of the most traditional Dubai souvenirs that you can give away to your colleagues and friends as a decorative item for their houses and offices. Pashmina shawls are among the top choices of visitors. It is the most preferred Dubai souvenir or gift item that is chosen by the tourists and visitors. Dubai has a wide variety of Silk and Viscose Pashminas that are finely made and are the perfect token of remembrance for your wife, girlfriend, mother, a friend’s sister, and business colleagues. The most preferred place to buy Pashmina’s in Dubai is from Deira and Bur Dubai. Sand-glass decorations are also famous to be given as souvenirs from Dubai. They are quite affordable yet beautiful at the same time. Additionally, you can easily find them in the ‘Home & Decoration’ sections of the supermarket and at the stalls too. These are the most preferred Dubai souvenirs and gift that visitors usually choose to take along with them. To extend the list further please comments below.